L-Lysine Powder cat respiratory health supplement helps relieve symptoms of cat's runny nose or watery eyes, cat sneezing, or cat upper respiratory infection. Lysine supplement for cats is arguably the most important Amino Acid nutritional supplement you can give your cat. L-Lysine supports the immune system, normal respiratory health, eye health and function, tissue repair and acts as an antioxidant; removing toxins and free radicals from the body. 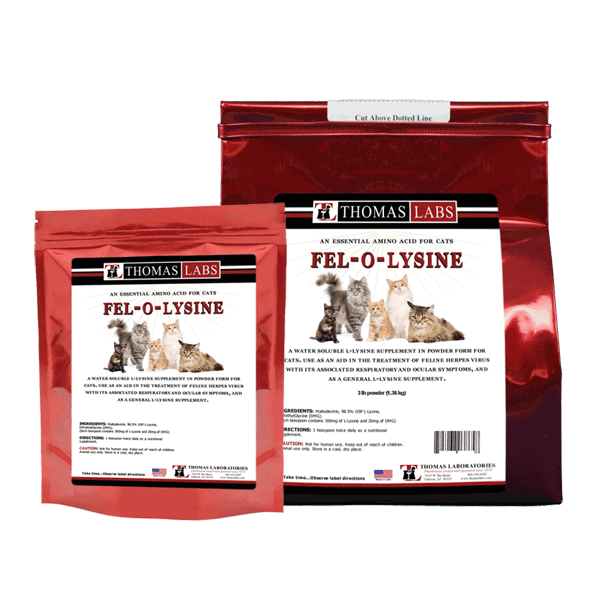 L-Lysine is the first defense against the symptoms of Feline Viral Rhinopneumonitis (FVR), Rhinotracheitis Virus and Feline Herpes Type 1 (FHV-1) and other, nonspecific, upper respiratory infections. All cats, whether sick or not, can benefit from the immune boosting properties of L-Lysine to help maintain proper health before a sickness or disease can take hold. Easy dosing, just place on normal moist or wet food rations. Cats love the taste. INGREDIENTS: Maltodextrin, 98.5% USP L-Lysine, DiMethylGlycine (DMG). (Each teaspoon contains 300mg of L-Lysine and 20mg of DMG) DIRECTIONS: 1 teaspoon twice daily as a nutritional supplement.